Leather bracelet embellished wtih engraved metal accent bar; classic design; toggle clasp; brown leather with gold over brass; rhodium plated finish to prevent tarnishing. 8" size fits most adults. Lead and nickel free. 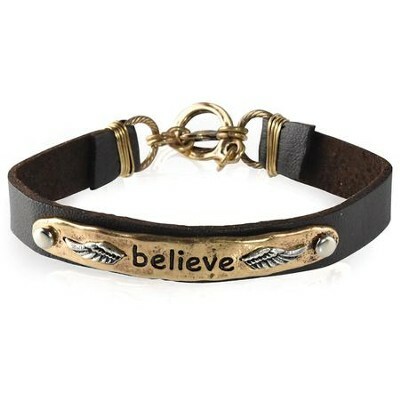 Believe; silver wings on hammered gold. I'm the author/artist and I want to review Believe Leather Bracelet, Gold.